Trek is known for incorporating tough frames into their bikes while not sacrificing weight. 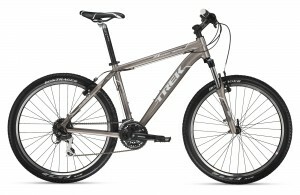 The Trek 4300 is one of their entry level bikes which is capable of handling off and paved road rides. 4300 is Trek’s best selling mountain bike platform. Lifetime limited warranty on the frame. The Trek 4300 is a good first bike. It’s great for casual rides but is also capable of handling a few bumps and jumps on rough terrain. The only downside of this bike, as pointed out by many buyers as well, is its poorly done bike saddle which can be uncomfortable at times. 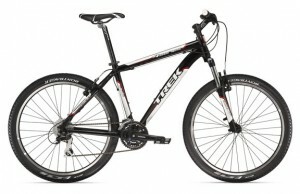 But overall, the Trek 4300 is well worth its price and is recommended for beginners to get a feel of multipurpose bikes. Trek currently doesn’t offer direct sale from their website. But you can check out their dealer locator page to find out where best to buy the Trek 4300. This entry was posted in Mountain Bikes, Trek and tagged trek 4300 review, trek mountain bikes. Bookmark the permalink.